Present state: Platforms demolished. Station building was in use as a restaurant until 2007. 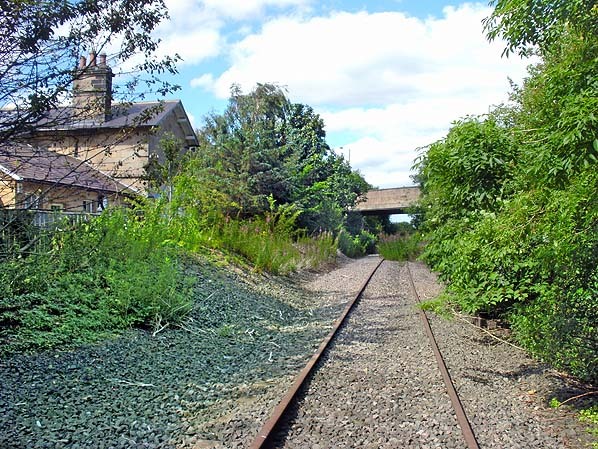 Notes: The village of Shincliffe at one time possessed two stations. One was the terminus of a branch from Murton and, at its opening in 1839, was the closest station to the city of Durham. This station became Shincliffe Town in 1861 and closed entirely in 1893 when the branch was diverted to a new terminus at Durham Elvet. The other Shincliffe station, which concerns us here, was on the Newcastle & Darlington Junction route between Ferryhill and Leamside, and it opened in 1844. It was midway between the villages of Shincliffe and Bowburn, each about a mile distant. In 1839 Shincliffe Colliery had opened about half-a-mile north of the station’s site, and a small village developed close to it, but the colliery was to close in 1875. 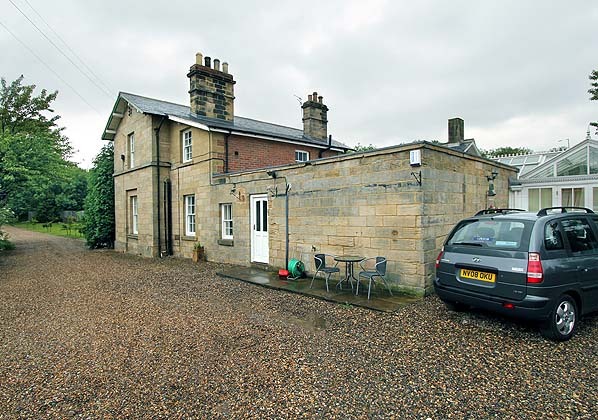 Shincliffe was provided with an attractive station building by G T Andrews, described by Fawcett (2011) as the ‘classic example’ of his work for the N&DJ company. Adjoining the down platform, the building had its axis at right angles to the tracks and was constructed of sandstone blocks, laid in courses, with a ridged slate roof. The distinctive hipped-roof ground floor bay window, favoured by Andrews, faced the platform; when the height of the platform was increased this resulted in the window cill being almost at platform level. An arched porch was centrally placed on the northern elevation. A single-storey extension containing offices stretched south from the two-storey section, and its ridged roof, like that of the two-storey building, had a generous overhang. A signal box stood on the platform immediately south of the passenger buildings, the upper portion cantilevered out so that the platform was not obstructed. A waiting shelter was on the up platform. No footbridge was provided, passengers having to avail themselves of the road overbridge immediately north of the station. 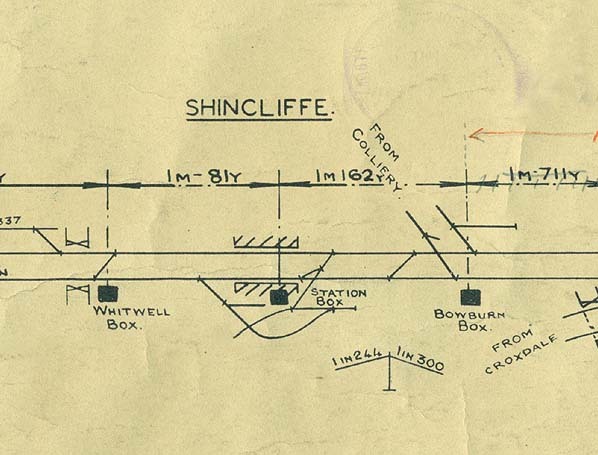 The goods facilities were reached by a loop behind the down platform, and the OS 1897 plan indicates that the loop also served Shincliffe sawmill. The 1920 plan no longer names the sawmill. Goods handled in 1913 consisted of 187 tons of potatoes and 34 wagons of livestock. Pedestrian access to the main building was gained by crossing the loop siding. NER statistics of 1911 indicate that Shincliffe station served a local population of 3,690 and that annual bookings amounted to 17,394 tickets. During the 1920s bus routes linking the closely spaced villages of the Durham coalfield began to offer stiff competition to railway services. In the case of Shincliffe the demand for public transport was to and from Durham, whose city centre was 2½ miles north- west, whilst the railway provided a north-south service to the distant centres of Newcastle, Sunderland and Darlington. 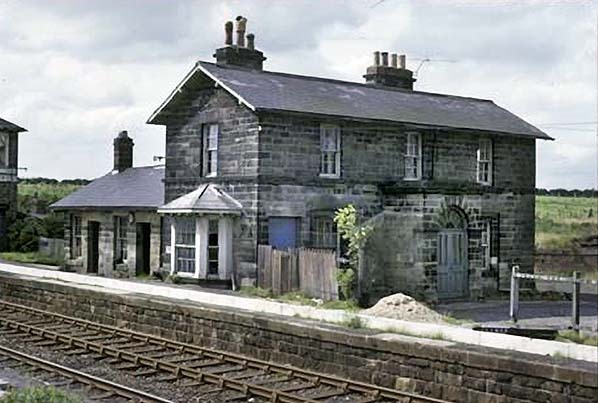 The station stood in a lightly populated area adjacent to the main road to Durham and was inconveniently placed to serve Shincliffe village which was a mile north, and on the way to Durham. As noted above, the colliery close to the station had ceased to operate as early as 1875. The table below shows that in June 1920 the weekday train service offered by the North Eastern Railway was far from frequent. On Sundays a morning and evening train called in each direction. The winter 1937-8 service had decreased to four up and five down weekday trains, with only one morning southbound departure on Sundays. Although the LNER intended to close Shincliffe and neighbouring Sherburn Colliery stations in 1939 passenger services continued until 1941. Goods facilities were retained until November 1963. For some years the station building was used as a restaurant, trading as the Station House Restaurant until 2007. Ticket from Michael Stewart. Bradshaws from Chris Totty & Nick Catford. Route maps drawn by Alan Young. 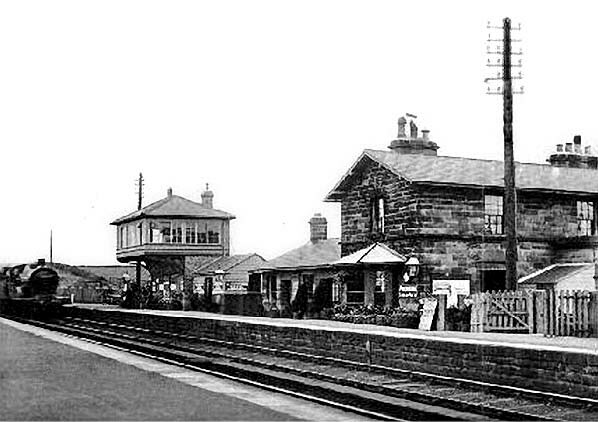 An early twentieth century view of Shincliffe station, looking south-west from the up platform. The station building is already soot-blackened, despite its semi-rural setting. The passenger entrance, seen next to the telegraph pole, was later replaced with one immediately to its left, and the entrance shown here was replaced with a window. The distinctive cantilevered-out signal box was of a style generally used on constricted sites; in this case the presence of a goods siding behind the platform was the reason. 1897 1:2,500 OS map. The isolated position of Shincliffe station is apparent, accompanied by a sawmill, Moor House, and four railway cottages. The station is south of the road bridge, the main building being west of the railway. By this date sidings have sprawled away from the down (west) track handling the station’s goods traffic and serving the sawmill; in the process the road access to the station building has been obstructed by a siding, but the stationmaster and passengers must have simply had to cross it. Access to the semidetached railway cottages south-west of the station building is even more inconvenient, with three sidings to contend with. Another block of semidetached cottages is found close to the road entrance to the station site. On the up platform a passenger shelter is provided. The signal box is shown north of the bridge, adjacent to the down track, but it would shortly be closed, with its replacement located south of the bridge. 1920 1:2,500 OS map. By 1920 Shincliffe station, despite being a locally important goods facility, has still not attracted any housing development. The sawmill named on the 1897 map is no longer shown as such, but the sidings remain. The signal box north of the bridge has closed, and its replacement has been built on the down platform, south of the station building, from which the through lines are still easily seen by the signalmen, but a far better view could be obtained of the sidings. 1960 1:2,500 OS map. 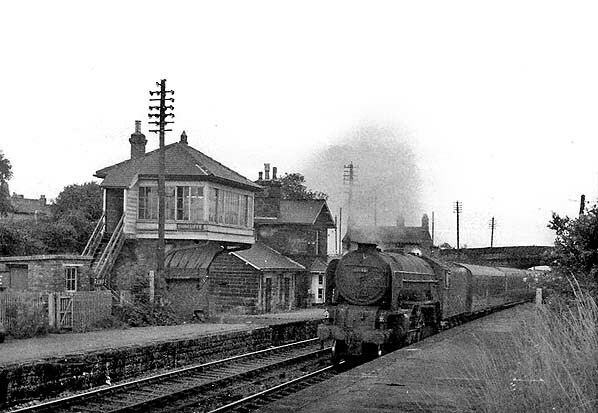 Shincliffe station, having closed to passengers in 1941, is correctly shown as a goods station in 1960. The former station building is now identified as ‘Railway Cottages’, and the two sets of semidetached railway cottages marked, but not named on the earlier maps, now have numbers added to them. The goods siding layout has been simplified since 1920, and the building on the up platform has been removed. 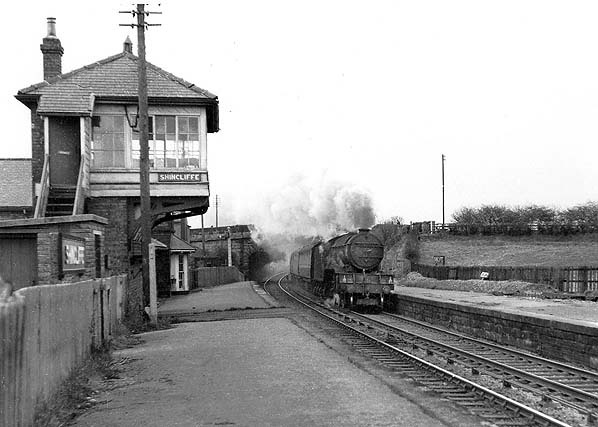 The station would close entirely in 1963. 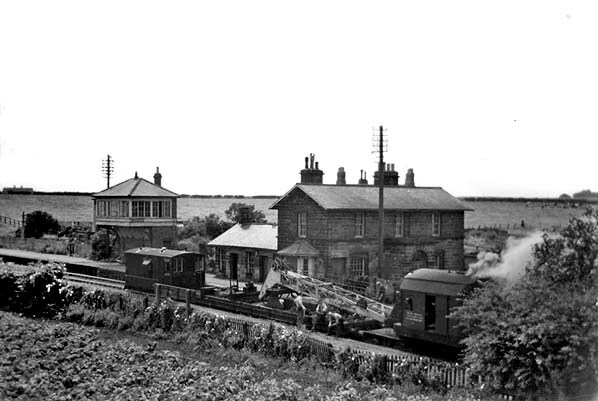 The surrounding area remains as rural as it was when the station opened over a hundred years before. Looking south from the road bridge at Shincliffe station; the photograph is thought to date from about 1938, shortly before it closed to passengers. Beyond the vans in the siding is the station building with the NER signal box beyond. The only building on the up platform is an NER timber ‘rabbit hutch’ waiting shelter. The platforms appear to be gas-lit. 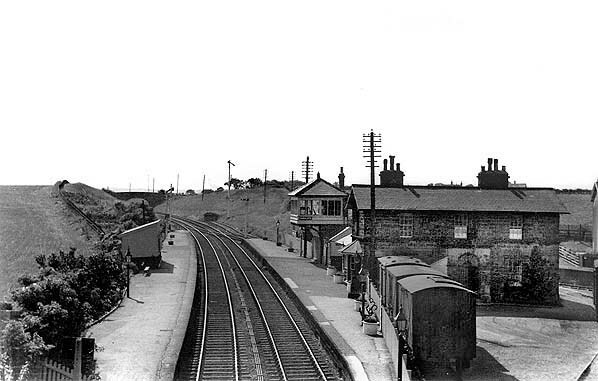 Looking north on the down platform of Shincliffe station c1950s; the station had closed to passengers in 1941 and would remain open to goods until 1963. The LNER running-in nameboard is still in place, possibly in the expectation that excursion trains might use the station after official passenger closure. The cantilevered-out signal box is prominent, and the distinctive G T Andrews canted bay window on the station house can be seen beyond. In this undated view a southbound express passes through Shincliffe hauled by an A1. The cantilevered-out NER signal box and the station building are visible on the down platform. In July 1961 a maintenance train, including a steam crane, is on the up track at Shincliffe station. The station building and signal box can also be seen in the view looking south-west. Shincliffe looking south from the road bridge in 1962. By this time the station had been closed to passengers for over 20 years, but goods traffic would be handled until late 1963. 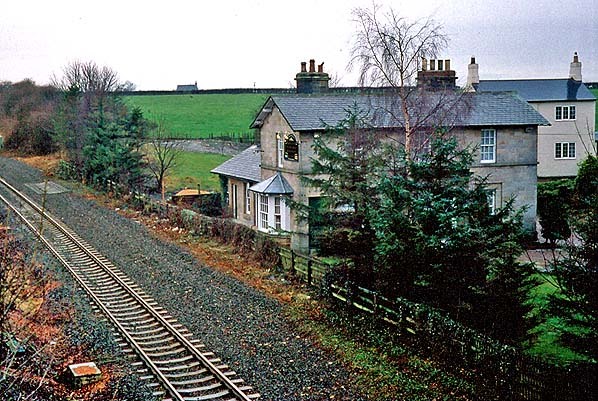 A pair of railway cottages is seen on the right, beyond the siding, and the station building is seen in the centre of the picture. Access to the station was across the siding en route to the door on the far left (for passengers) or the arched porch for the stationmaster. The cantilevered-out NER signal box is beyond the station building. By this time the passenger shelter on the up platform has been demolished. 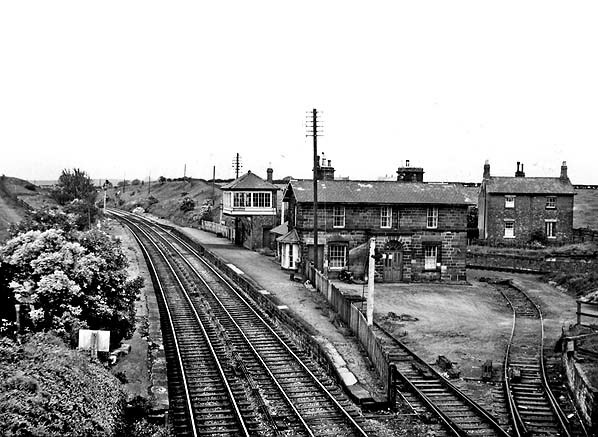 Shincliffe station in August 1966. The station had closed to passengers in 1941 and goods in 1963, but the platform is still in place. It is evident that the station originally had a very low platform (or none at all) as the bay window is buried up to cill level. This building is a good example of the work of architect G T Andrews, with its sturdy two-storey sandstone villa aligned at right angles to the platform and distinctive features such as the ground floor bay window with modillions and slates above, the elegant porch and the overhanging roof. A single-storey office range extends along the platform, perpendicular to the main building’s axis. 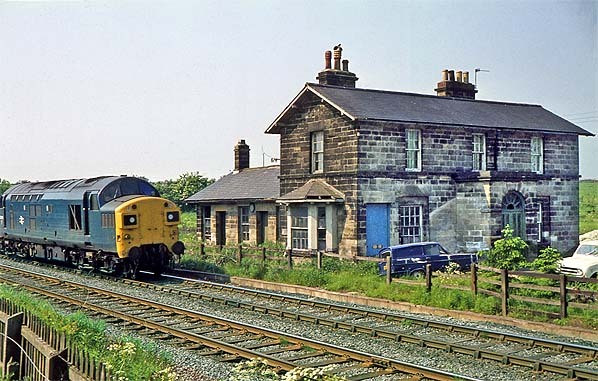 A Class 37 diesel is northbound past the former station site at Shincliffe in 1978. The station building is well preserved, west of the tracks. Shincliffe station, looking south-west from the road bridge on 30 December 1999. By this time the station building is used as a restaurant. 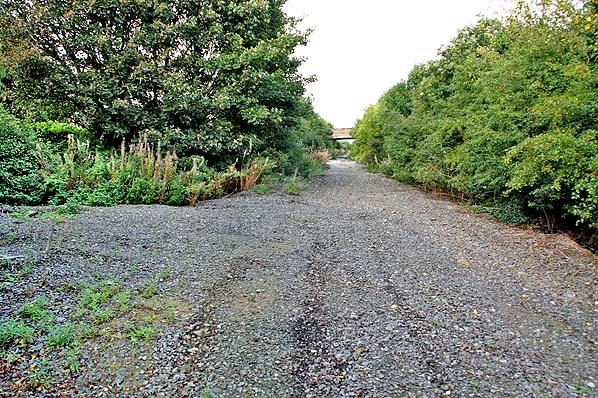 The single railway track has been out of use since 1991 when the route was ‘mothballed’. The western elevation of Shincliffe station building looking north-east in June 2011. Apart from the relatively inconspicuous red brick section, the station is of sandstone and has been cleaned – apart from the chimneystacks. In July 2011 this view northward is from the centre of the former up line through Shincliffe. Although the ballast looks fresh, the true state of affairs is disclosed by the encroachment of vegetation before the bridge, as the line has not been used for twenty years: it was ‘mothballed’ in 1991 and would be closed in 2012. The station house can be seen to the left. Looking north at the site of Shincliffe station in October 2013, a year after track lifting. The platforms were demolished in the late 1960s. The station building is obscured by trees on the left.